Engineered and manufactured to the same exacting standards as all Omnipure filters, the E & ELF-Series’ expanded volume and higher flow rates are ideal for commercial applications such as equipment protection and water polishing. Each filter series is tested with a maximum pressure of 125 psi and a maximum temperature of 100° F.
Bacteria can piggyback on Sediment, Must Have! ELF=Extra Large Format 3.5" x 10" or 15" lengths. Capacities of up to 20,000 gal. Flow rates of up to 2.0 gal/min. The E-Series and ELF-Series are both a replacement filter body engineered with a universal cap, designed to affix to existing permanent heads, including Everpure® Standard Heads for Example. (note; Everpure QL1 Heads are Smaller Diameter, Omnipure suffix is "-SB" for Small Bayonet.) This series offers similar performance to existing replacement filter bodies on the market, but is offered at a much lower price. The new E-Series and ELF-Series are designed for our customers that are already using existing Everpure permanent heads but would like an alternative to the replacement bodies currently offered. The E-Series and ELF-Series also fit Omnipure ELF-Heads ELF-HEAD-DK7 AND ELF-HEAD-DK7-P6. The main benefit of the E-Series and ELF-Series is price to performance value. 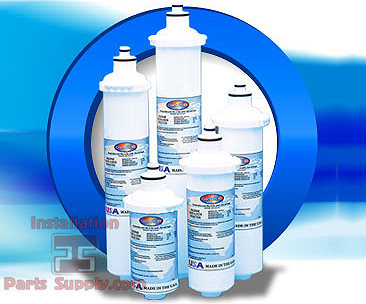 E-Series Water Filters, with equal or superior filtration capability, are offered at a considerably lower price than comparable replacement bodies on the market. Omnipure utilizes several media or media combinations to address standard water problems including Granular Activated Carbon (GAC), Polypropylene Depth Filtration, and Polyphospate. Omnipure also offers one or ten micron Carbon Blocks, Carbon Blocks with Lead Absorbent Material and Carbon Blocks with Scale Inhibitors to address specific water conditions. 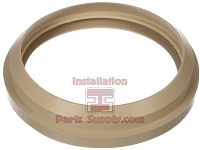 E-Series replacement bodies are offered in 6”, 8”, 10”, 12”and 14” lengths. Bodies are tested to withstand pressure of 125 psi and temperature of 100º F. Media service life is designed to handle up to 3,000 gallons in some models and filtration micron ratings are as low as 1 micron in other models. The ELF-Series of filters from Omnipure was designed specifically for the higher volume requirements for the food service industry. In contrast to what the name implies, the new ELF’s (Extra-Large Format) capacity of up to 20,000 gallons and flow rates of up to 2.0 gal/minutes, make it ideal for use in restaurants, cafes, coffee shops and vending machines. Omnipure has developed an entire series of carbon blocks to work in the extra large ELF filter body. The Omnipure Blocks™ available in the ELF-Series include standard 10 and 1 micron Carbon Blocks, Lead-Specific Carbon Blocks and Polyphosphate / Carbon Blocks for equipment protection from contaminants associated with hard water. All Omnipure filter bodies are made with virgin, high-impact polypropylene which is especially ideal for use in applications where sanitary conditions are required. All materials of construction are NSF and/or FDA approved.